Battlefront is featuring a new vehicle for Tour of Duty over on their website. This one's the M42A1 Duster, though I'm not sure how well it would tidy up a room. Seems like it'd make a mess, rather than clean one up. M42A1 Duster (VUS161) includes one M41A1 Duster & one American head sprue. 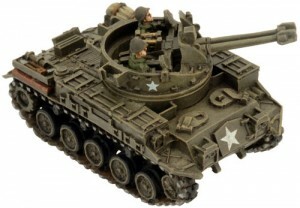 The experience of the Korean War led US Army officials to begin the phasing out of the M24 Chaffee in favour of designs based around the more modern M41 Walker Bulldog. Included in the M24 family of vehicles was the M19 GMC. Developed towards the end of the Second World War, the M19 was armed with two of the highly effective 40mm Bofors anti-aircraft guns mounted in an open-topped turret capable of traversing 360º.